Pelesys is a global leader and provider of aviation training management solutions for airlines, training organizations, OEM’s and MRO’s including our best in class aviation maintenance training solutions. Our courses are delivered as instructor-led or computer-based (CBT) and are customized to fit our customer’s requirements. We are always innovating our courses with the integration of new technologies including virtual reality, and interactive schematics. All of our maintenance training courses hold regulatory approvals from EASA and Transport Canada. 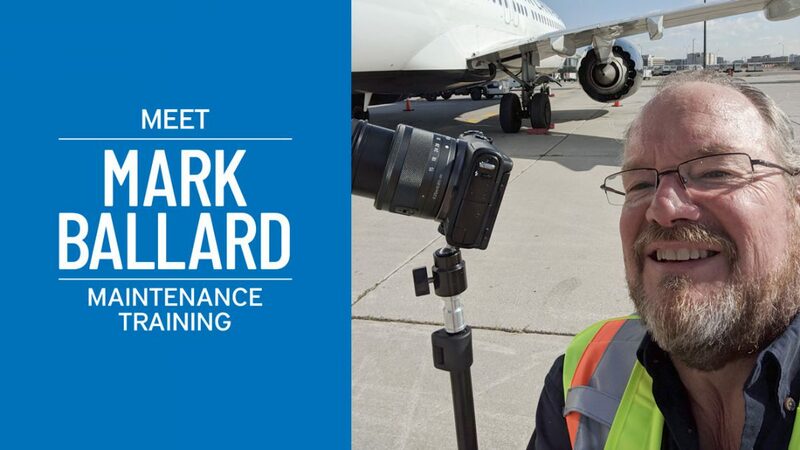 As the director of aviation maintenance training Mark Ballard has been with Pelesys since 2010 bringing over 38 years of line and heavy maintenance experience to Pelesys and helping us innovate and grow our aviation maintenance training programs. We are thrilled to have Mark on our team and sat down with him for this employee feature, part of our on-going series, to get to know him a little more and give you a little insight into the corporate culture at Pelesys. What do you do at Pelesys? As the director of maintenance training, I assist the management team in coordinating courses and the associated logistics. Also, a bit of sales, communications, strategy, training development and on occasion in the classroom instructing. Innovation was tagged on as we began to integrate gamification and virtual reality into our maintenance training programs. I started in 2010 when Jim Cairns asked if I could assist with a lecture-based Boeing 717 course on Hawaii. How could I resist! The B717 is a renamed Douglas DC9 which was the first aircraft I wrote exams for. Was an interesting assignment and the rest is history! What did you do before Pelesys? I attended Centennial College in Toronto for Aircraft Maintenance. The best 12 months I can think of! I then worked several months in general aviation at a tiny Fixed Base Operator (FBO) called Elmsdale Aviation in New Glasgow, NS. There I worked on all kinds of small aircraft from Ercoupes and a Chipmunk to more popular Cessnas and Pipers. Then it was off to Air Canada gaining experience on DC8, DC9, B727, A320, L1011, EMB and CRJ’s with some work on the big Airbus’ and B747s on occasion. Over time I worked up from a Learner Mechanic to Foreman, Maintenance Operations Controller, U.S. Maintenance Rep based in DCA/IAD to the Base Manager for Atlantic Canada and finally the Line Maintenance Training Manager. I had a great career at Air Canada and although there were a lot of midnights in the first several years, I don’t regret my choice. Lots of opportunity for growth and self-advancement were provided. The cohesive nature and relationships of a smaller company. This results in quick decision making and the ability to change direction accordingly. Of course, the people make all the difference! Using my experience to assist in making a strategic difference to help Pelesys to grow. I spend a lot of time on my woodlot and cabin on Cape George NS. Its off grid and a great place to decompress and enjoy nature. Its only a :20 drive from my home so easily accessed. I also work quite a bit with our local Syrian refugees on the steering committee of our local organization. We are now assisting the integration into Canadian society of over 7 families extracted from that chaos. I would have to say Botswana. It was 30 years ago but traveling around camping at that time was an amazing experience. Nothing like waiting for a bull elephant to move off the road or listening to crocodiles snapping at ducks on the Chobe River several meters away while trying to get to sleep in a tent! What’s trip is on your bucket list? I have never been to South America for pleasure. An interesting audit in Suriname spiked my interest. I am not picky, but Ecuadorian mountains or Argentinian steaks and wine would work for me! Our aviation maintenance training department is growing quickly providing innovative maintenance training to companies around the world and we are always looking to add new talent to our team. If you’re looking for a career in the fast-paced exciting world of aviation check here for the latest career opportunities at Pelesys. Should you have any questions about our maintenance training programs, or any of our aviation training courses please get in touch with us by calling us at 604-233-6268 or sending us an email to sales@pelesys.com.